Switch provides extremely fast, reliable fiber optic internet services across the globe. Switch enables comprehensive reach through our extensive network footprint and via partnerships with other leading network providers. In terms of network configuration and performance, the distinction is seamless. Customers benefit from the combination of a strong and growing fiber footprint and carefully negotiated strategic partnerships with local providers, resulting in end-to-end global solutions. Switch provides extremely fast and reliable fiber optic internet services across the globe, terminating in our state-of-the-art core facilities. Typical deployments include government, SME businesses, enterprise corporations, hotels, remote lodges and oil & gas facilities. 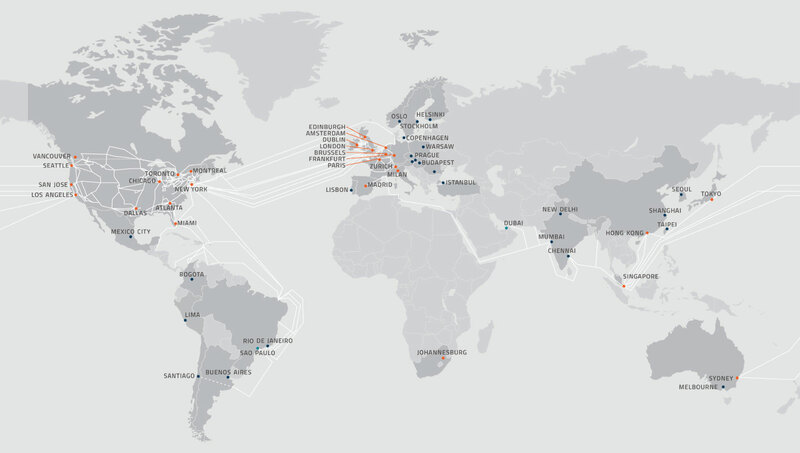 We connect more than 1,100 data centres across the Americas, Europe, Asia and Australia—and continue to expand our partnerships to extend our global reach. Our agility and reputation for quickly responding to our clients’ demands sets us apart from the competition and allows us to specialize in delivering major services to projects or locations with tight timelines and other restrictions. Fiber That Is "Close Enough"
Switch is an expert in last-mile wireless delivery, so even if your location does not have fiber physically deliverable to the premise, we can connect the closest fiber POP to our state-of-the-art microwave radio equipment and create a reliable, high-speed, secure, wireless internet link. In this way you can enjoy the speed and low latency of fiber without the expensive construction costs.